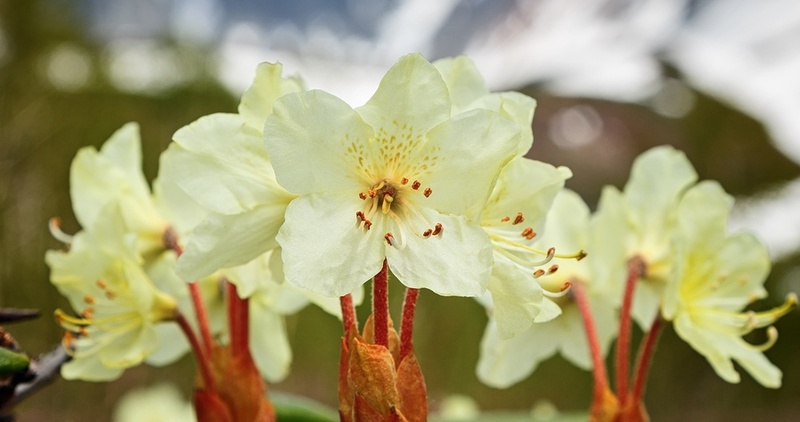 Common Names: Siberian rhododendron; golden flowered rhododendron; rhododendron aureum. Rhododendron chrysanthum (Rhod.) is a one of the remedies for rheumatic and neuralgic pains, especially of the joints. Those needing Rhod. are sensitive to barometric changes and can foretell the approach of a thunderstorm. Any sort of symptom may start or worsen before a thunderstorm – headache, pain, cough, diarrhoea, etc. – causing the sufferer to be anxious with the approach of a storm, even to the point of fear. Symptoms also worsen with wind or cold, wet weather but improve with warmth and gentle ongoing motion. The male gonads may also be affected with orchitis or epididymitis being common problems. Two unusual symptoms that may be experienced are that the person will only be able to sleep if their legs are crossed at the ankles, and the sensation of water being dashed against inner parts may occur. Anxiety or dread before a thunderstorm. Headache with barometric changes and before thunderstorms. Neuralgic eye pain before a storm. Gouty, rheumatic pains, especially before a storm or with barometric pressure changes. Pains that move from spot to spot but relieved by gentle and ongoing movement. Unable to sleep unless legs crossed. Orchitis and epididymitis (inflammation and pain in the testicles), especially the right. Pain and swelling in testes which starts on the right side but may then alternate sides. Rhododendron chrysanthum (Rhod.) is available from our online store as a single remedy in either pills or liquid and as part of the following Complex (combination remedy): Joints – Stiff. For acute and self-limiting complaints, take one pill or five drops of the remedy every 15 minutes to 4 hours (15 minutes for intense symptoms, 4 hours for milder ones). Once an improvement is noticed, stop dosing and repeat the remedy only if symptoms return. If there is no improvement at all by three doses, choose a different remedy or seek professional guidance. Chronic symptoms or complaints require a course of professional treatment to manage the changes in potencies and remedies that will be required.